NASA discovers two black holes fighting each other in a "death spiral"
At first we thought this galaxy's unusual properties seen by WISE might mean it was forming new stars at a furious rate. But on closer inspection, it looks more like the death spiral of merging giant black holes. The lead author of the study, JPL's Chao-Wei Tsai, says that they "think the jet of one black hole is being wiggled by the other, like a dance with ribbons. 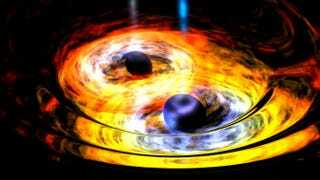 If so, it is likely the two black holes are fairly close and gravitationally entwined." Must be a beautiful—and terrifying—view, as the artist impression above suggests.